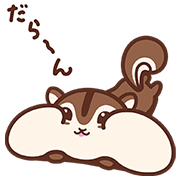 http://www.line-stickers.com/ – Yurukawa Choris Line Sticker | Choris, the chubby-cheeked squirrel from JA Bank’s well-known ads, is back yet again with another cute sticker set! Let her jiggling cheek pouches astound you! Friend JA Bank’s official account to get the set for free. Available till December 19, 2016.